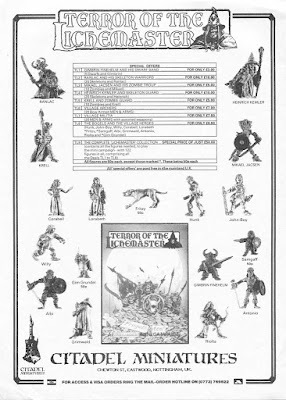 If you go by the flyers published by Games Workshop in 1986, Gimbrin Finehelm is the only dwarf that officially goes with the Terror of the Lichemaster scenario pack. However, the campaign book written by Rick Priestly tells us that Gimbrin is accompanied by a small warband of five dwarf adventurers. So a hobbyist like me or you is left with a lot of elbowroom. What miniatures to use for these supporting cast members? Gimbrin himself provides some guidance on what minis are best. 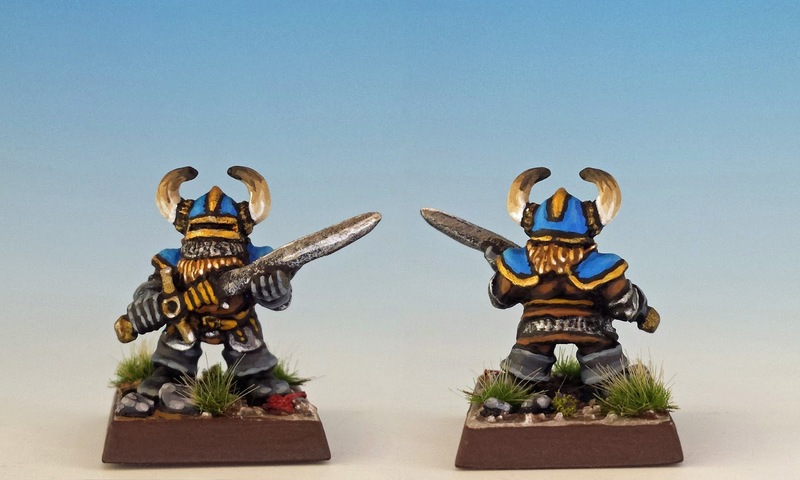 Although a beautifully sculpted dwarf, he is noticeably on the small size. 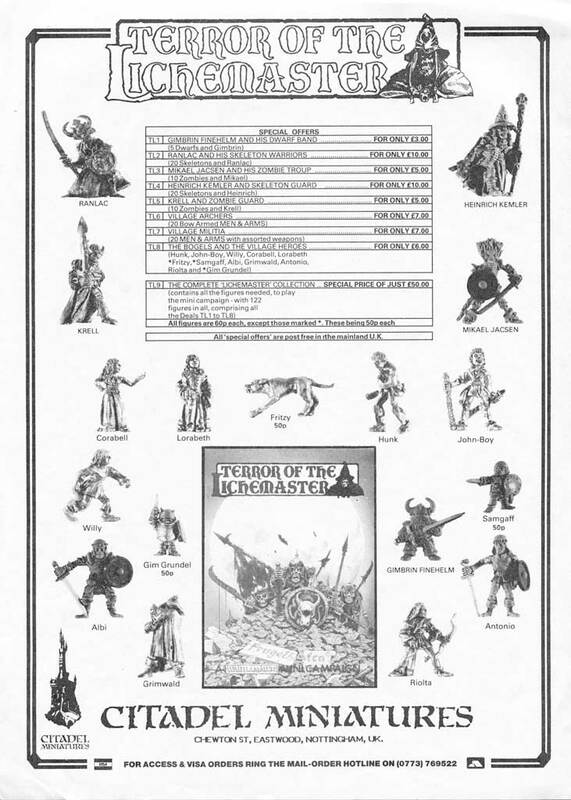 He fits in with Citadel's early range of Fantasy Tribe Dwarves (1982) or the C06 Northern Dwarves (1984), rather than the vastly more common D5 Imperial Dwarves (1986) which dominated the rest of the Eighties. These later dwarves are taller and stouter than their earlier cousins, and so using them would make Gimbrin seem puny. In this case, the game designers seemed to be thinking that Gimbrin's retainers would be one of the early models sculpted by Michael and Alan Perry in 1985 for the C06 range of Dwarves. Specifically, it's the "Bandit Dwarf" with the distinctive aventail or curtain of mail covering his face. Great choice! 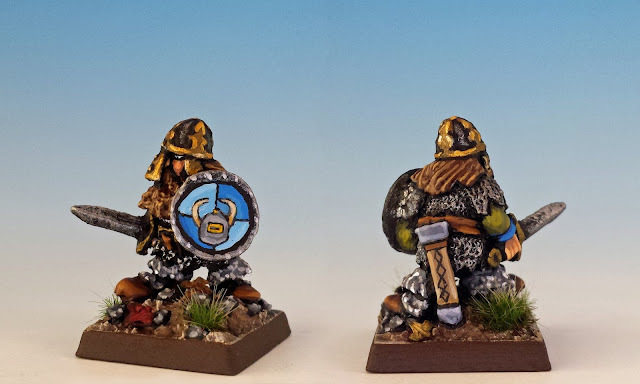 This Bandi miniature is smaller in scale, and has always been one of my favourite dwarves. And then I realized what made him an especially good candidate: he has an eye-grabbing helmet. Eureka, I said to my cat. After all, we are talking about Gimbrin Finehelm! Clearly his followers must be similarly attired in fabulous head-ware. And so, I began combing through the Citadel back-catalogue for other old miniatures with stand-out hats. First is Carling the Black. As a young and violent dwarf, he lost his way, wandering from his ancestral hold and taking up banditry in the Grey Mountains. But when he met Gimbrin, he saw a leader worth following, and decided to return to a proper dwarven existence: mining and honourable clan warfare. The second swordsman is Molson Olson. Like Carling, he proudly carries the device of the Finehelm Clan on his shield. He is an old retainer of Gimbrin's family, known for his great strength and baritone singing voice. His helmet features a huge nasal-guard chased in polished brass. (Molson's miniature is a preslotta C06 Northern Dwarf from 1984). Next comes the crossbowman Rickard the Red. The youngest of Gimbrin's dwarves, he's keen-eyed and often takes the role of scout. He claims to speak the croaking tongue of crows and jaybirds, a talent often ascribed to ginger-haired dwarves. His helmet is a riveted Great Helm of a type often used in 13th century Northern Europe. 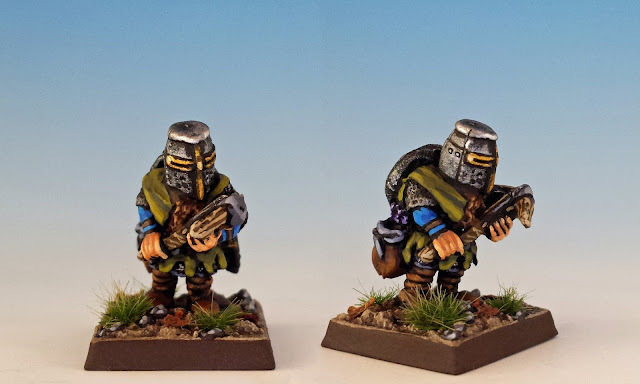 (Carling's miniature is one of Citadel's preslotta Fantasy Tribe D2 Dwarf Light Crossbow from 1981). Finally, we have Hockley Darkbrew, the third and last crossbowman. He is taciturn, even by dwarf standards, and his companions report that the only phrase he's uttered in the last three months was "Pass the tatties, ye nugget." His helmet has a Phrygian peak and a facemask, making it similar to the helms used in the Norman kingdom of Sicily in the 12th century. (He is another Citadel preslotta Fantasy Tribe D2 Dwarf Light Crossbow from 1981). 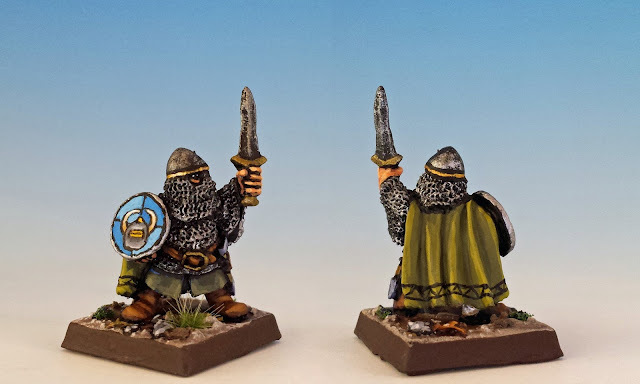 I thoroughly enjoyed exploring the range of dwarf miniatures from the early 1980's, what with their fine sculpting and foundation in historically accurate armor. Stay tuned for my next post in the Lichemaster series... Mikael Jacsen and his zombie dancers warriors. Well done, I don't know that I've ever seen this models before! So many of the pre-slotta models look terrible in an unpainted state, but it's amazing how they look when painted. I think u night have to track a few of these down now! Awesome work Matthew!You have restored this mini for life! 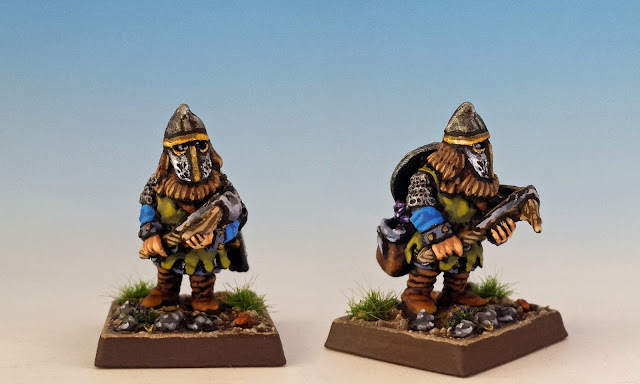 Usually not fond of pre-slotta dwarves, but the crossbowmen add some variety with respect to the classic imperial dwarves range. I should I have used them in my own army. Nice job! 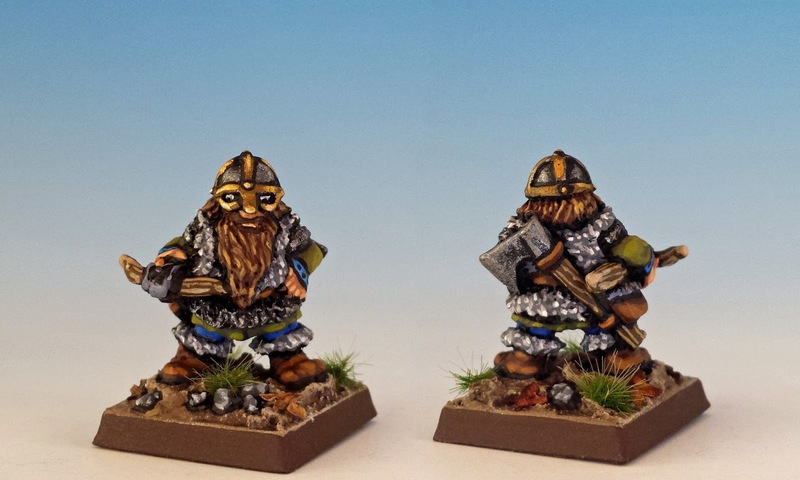 My favourite range of Citadel Dwarves well painted and based. Excellent! clapclapclapclapclapclapclapclapclap!!! Nice work! It's really a treat to see this project unfold. Such a classic scenario, and your figures and painting are wonderful! 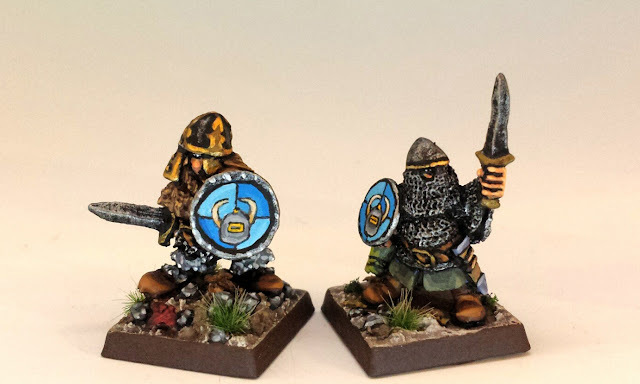 Love the use of the Fantasy Tribes dwarves! That is one of my favorite lines of dwarf minis ever. I love every single bit of what you are doing here. bravo! This post is like a field guide to helmets ;) Nice work, like the previous batch. That kelly green is really working for you! Thanks everyone! I'm gratified that you're enjoying this series. It's always reassuring to realize that other people are as interested in the minutiae of old games as I am. So thank you! Good painting and character bios!